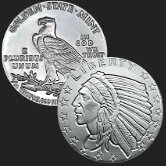 Thread: A major use for silver that has been hidden by history!!! Today I learned something new about silver that is actually quite old. An ancient human practice that seemed to work out at the end. Roman soldier's use of the denarius!!! Without modern tissue it would be messy though. 1/10 ozt .999 fine silver round.